Everyday while commuting on the bus he passed a goldfish and koi shop. This time since he was on foot, Andy decided to visit the koi store. It was love at first sight; Andy was amazed, with the beautiful koi. He observed fish tanks after fish tanks; the fish tanks housed stunning goldfish. Moreover, the ponds were filled with magnificent koi. As he visited koi pond to koi pond the koi would surface as if to greet him. In reality, they were seeking their koi food. Wow! Andy was impressed. After visiting the koi shop weekly, Andy started to make friends with Mr. Chan, the shop owner, and helped whenever needed. Mr. Chan wanted to give Andy a few fish and this excited Andy so much that he ran home to tell his mother. The next day Andy bought a goldfish bowl and then became the proud owner of his first fish. A few months later, Andy upgraded to a bigger tank. Then in 1971, Andy’s uncle helped him build his first koi pond. 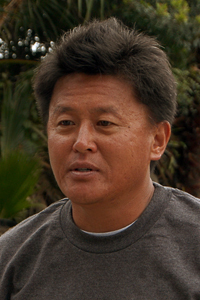 In 1980, Andy moved to the United States and lived in a condominium. In 1988, Andy built a koi pond at his new home. To date, Andy has the following water features, an 8,000, 11,000, 25,000, 5,500 and an 890-gallon goldfish pond. Further, he also built four tanks totaling 6,000 gallons, the systems are dedicated for koi research, through testing and experimenting in order to find methods to better enhance the growth of the koi, improve the color; maintain a healthy pond. Andy belongs to the Nishiki Koi Club and ZNA, Orange County Koi Clubs and has served as a show chairman a few times. In 1992, Andy’s employer began to layoff employees. This was the catalyst for Andy’s decision to venture into his own business; therefore, Andy launched Andrews Koi International. 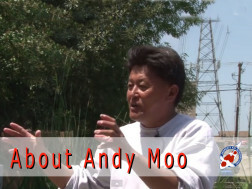 Andy Moo is the founding member of US district Shingokai. He judged the All Japan Koi Show twice (1998 and 2008) and while competing in the Japan show for the first time in 2008, Andy was awarded 2nd, 1st, two Sakura prizes (best in size B) and one best in class. Andy’s famous event is the “Annual Koi Growth Contest” held at Andrew’s Koi every year on the first Saturday in the month of May. There is over 1500-selected one-year-old koi available for purchase at $100.00 each. The koi will vary in size from 5 inches – 12 inches. Customers select fish, take them home, do their magic and next year bring them back to compete with all the other koi lovers. Koi hobbyist can learn from this event in the following ways, how to choose the koi, what to, how to and when to feed them. When you see other contestants bring back koi over 20 inches, with deep red color and nice white, it is a humbling feeling, knowing that everyone has room for improvement. Andy admits he learns from the koi growth contest every year. Andy is frequently invited, as a guest speaker to seminar and workshops and is always eager to share his wealth of koi knowledge with all koi hobbyists.